Recently, the participants in a course organized by the International Center for Tropical Agriculture (CIAT, its initials in Spanish) visited Estación Biológica Laguna de Apoyo to learn about land management in a protected area. CIAT course members tour the native tree nursery managed by GAIA. Hundreds of trees are grown in the nursery and transplanted into reforestation plots to re-created natural forest in the Laguna de Apoyo Nature Reserve. Photo Patricia Gómez. 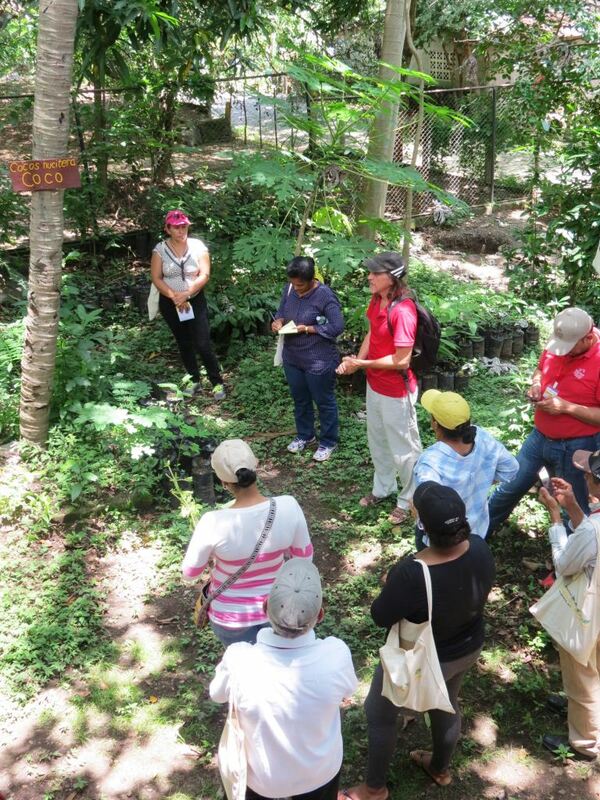 Although most of their course dealt with the traditional problems facing poor farmers in the country, such as weather insecurity, labor, credit, and technical assistance, here the issues are shaped by the special aspects of the protected area. 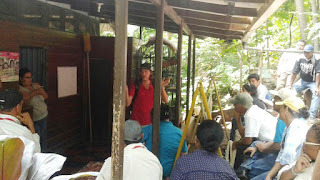 GAIA Director Jeffrey McCrary discussed with them the legal and technical issues facing land management in the area. Masaya Department, where the northern half of the reserve is located, is highly populated, but is historically a very productive agricultural area, with yuca, beans, sesame, and even coffee in the area near the Laguna de Apoyo Nature Reserve, in addition to the standard slate of smallholder crops which are often destined for personal use with excess production directed to the market, such as corn, plantains, and tree fruits. 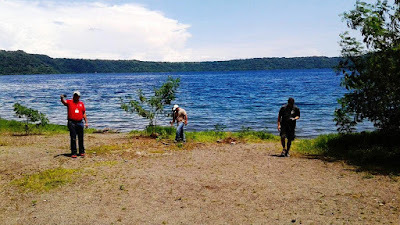 The classification of the lands inside Laguna de Apoyo Nature Reserve as part of the SINAP protected area system regulated by the Nicaraguan government, however, imposes overriding restrictions and prohibitions on several activities, among them agriculture. The area is dictated by a number of laws, regulations, and policies, which specifically prohibit agriculture, cutting plants, killing or capturing animals, and even building structures. Enforcing the policies has its own set of challenges, particularly because much of the land is in the hands of private landowners who wish to put houses on subdivided plots and sell them for profit. Even subdividing land is forbidden, as part of the Law 559. 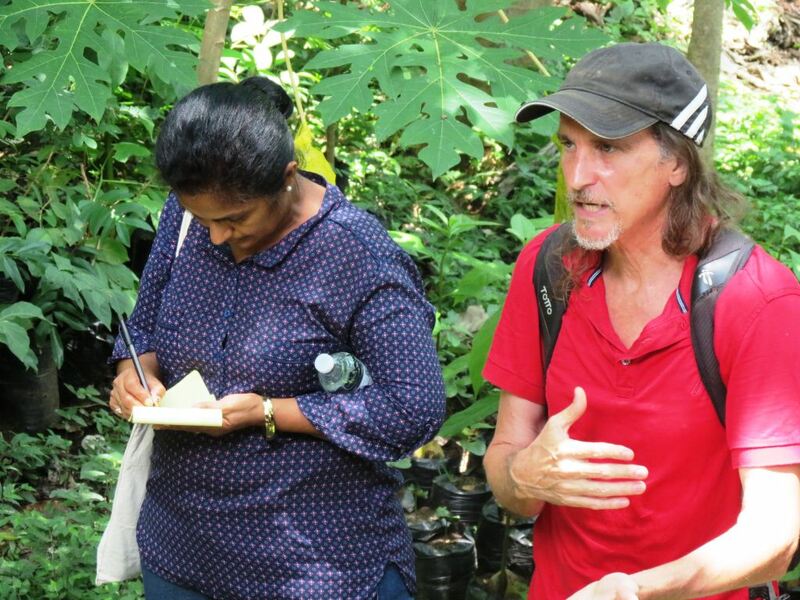 The management plan in effect in Laguna de Apoyo Nature Reserve, approved by decree in 2010, was produced by a team coordinated by GAIA director Jeffrey McCrary, who provided a brief review of the successes and failures of the plan since its implementation. Different interest groups were considered, such as mostly-foreign tourism business owners and vacation home owners, Nicaraguan renters on public land, the local community, and the community at large which includes all Nicaraguans, who have a voice in the way all natural areas are managed. Course members contemplate wild animal rescue and rehabilitation, another activity conducted by GAIA at Estación Biológica Laguna de Apoyo. Photo Pablo Somarriba. 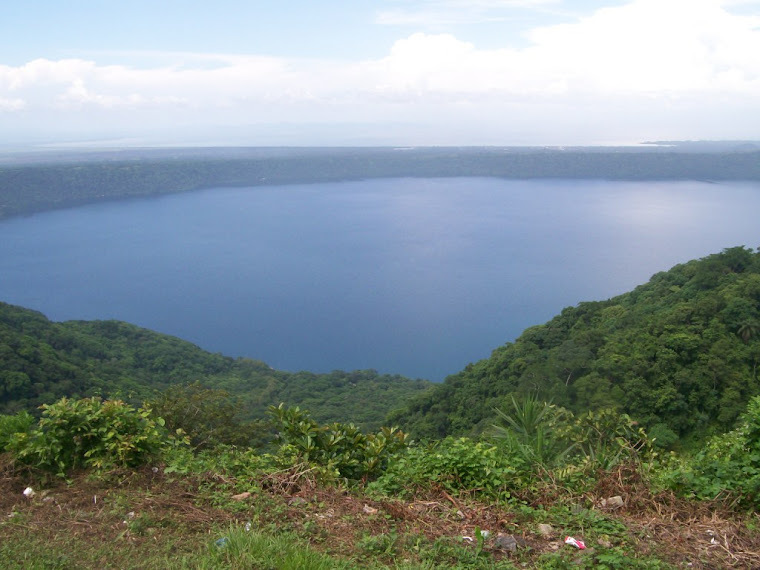 The most important single element of Laguna de Apoyo Nature Reserve is the lake at the bottom of its crater. In it, several fish species have evolved; six currently recognized species are only found in this lake. The lake provides unequaled views from near and far, and watersports opportunities, as well as serving as the only habitat in nature for these six species of fish. Strict policies are necessary to ensure that the lake remain pristine and uncontaminated. 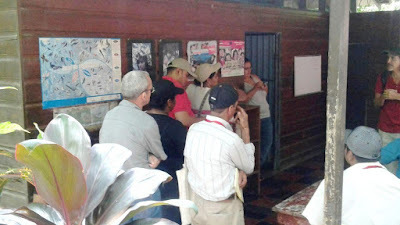 Issues discussed included the constant introduction of garbage from visitors and from a set of bars managed by Nicaraguans on municipal property, and the scandalous introduction of hundreds of tires into the lake by a group of non-Nicaraguan scuba divers puporting to represent a non-profit organization. Although the introduction of tires is regarded as patently illegal, the Nicaraguan government has found the challenges behind stopping this practice greater than their technical capacity to enforce the law. CIAT course participants enjoy views of Laguna de Apoyo and take selfies. Photo Jeffrey McCrary. We can make presentations for your group at Estación Biológica or elsewhere on environmental and development issues. 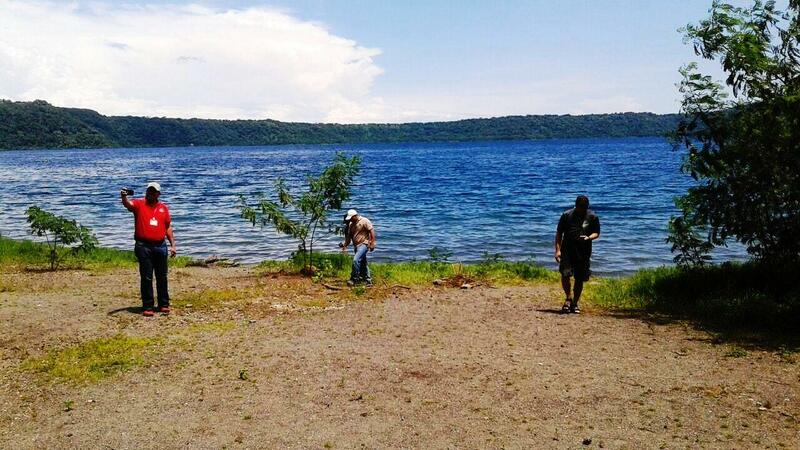 GAIA works in Laguna de Apoyo Nature Reserve and throughout the country. We have worked in every department in the country, and most of the 78 nationally recognized protected areas. Contact us by clicking on the "escudo" below to let us know how we can help you.